The voluminous figure of a dog in origami technique will becomeA great hand-crafted item that will decorate your desktop, any room and just bring a lot of fun while working. 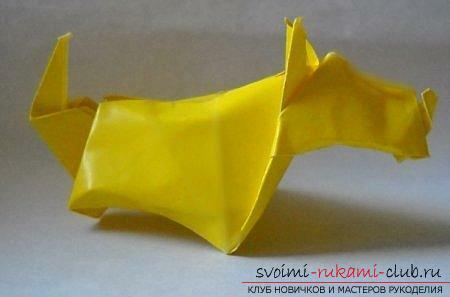 It is very easy to assemble such a figure of all beloved animals from paper. With work, anyone who wants to try their hand at this kind of art is easy to manage. The material of this article will become a good auxiliary tool for you. The art of origami is one of the constituent elements of the culture of Japan and China, where it originated. 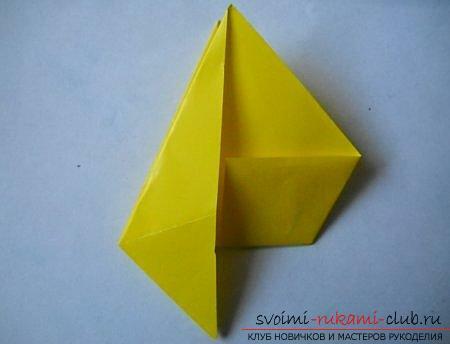 Initially origami was the production of simple figures from a sheet of paper, which were used in religious rituals. Over time, in the process of development and formation, new directions and ways of making hand-made articles in this interesting technique have appeared. First of all, this is a modular and voluminous crafts. 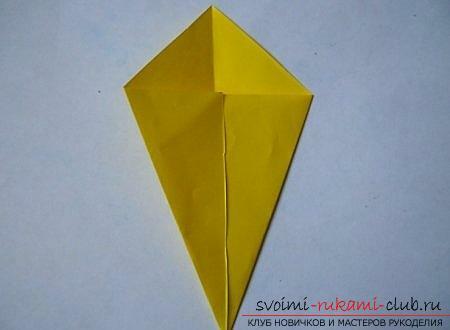 Recently, only a few decades ago, origami conquered the whole world. Many masters working in this technique create real masterpieces, it takes a lot of time and effort to work on them. With their light hand, beautiful castles, wonderful animals and birds and much more are born. And all this is created from ordinary material, to all of us familiar paper. It is not necessary to be a great master to fold an interesting hand-craft yourself. Even a child can cope with such a task. Of course, in this case it's better to work with the simplest models. Perhaps the most common hand-made paper made in the technique of origami, are a variety of animals. They can be executed both simple and from a large number of modules. Moreover, you can use different schemes for making the same animal. Well, if you are an experienced master in this technique, then your imagination will allow you to come up with an entirely new scheme yourself. 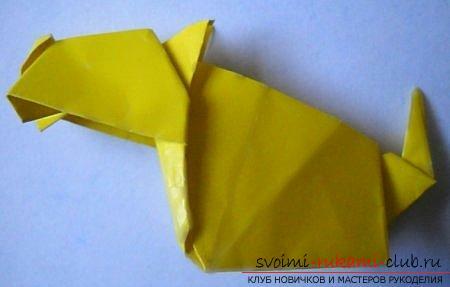 In today's article, we will learn to make from paper an uncomplicated figure of a beautiful animal - a dog. This figure though it is a simple model, but very interesting and beautiful. This is a three-dimensional model of the animal, created with the help of conventional, classical techniques of origami technique. 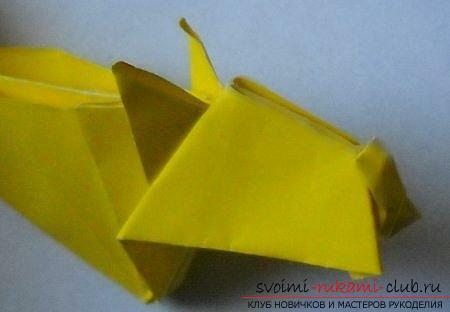 To add this amazing hand-crafted artifact - a three-dimensional figure of a dog in origami technique, we need to take a sheet of plain paper. Ideally, if this sheet is colored, then the product will turn out to be colorful, bright and interesting not only for the author of the creation, but also for those around him. At the first stage of the work, we need to fold the sheet along the diagonal line. Then we gently press both sides of the workpiece, and the one that is on the right side, and the one in the left, to the central part. As a result of simple manipulations, we get a figure that we see in the photo. Turn the workpiece over to the other side and bend itit is doubled along a horizontal line. Now, once again turn over what we have turned out, and add up its details, in this way, as shown in the next photo. The next step is straightening the workpiece. In doing so, you need to make a bend along the length of the body. During this action, we must bend the left side of the figure so that it is pointing upwards. The part of the side that is at the top, we are slightlyturn it backwards. We need to have dog ears. 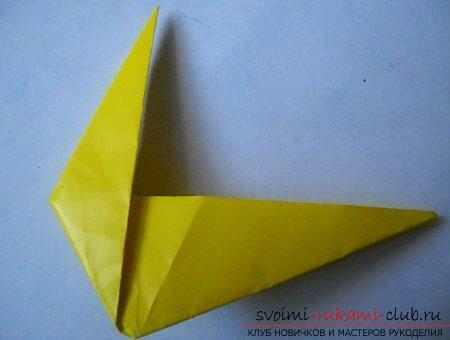 Make a small fold, pointing down. This action will help us form the muzzle of the animal. For the element to be fixed, we can sharpen the edge slightly upwards. Next we will take the edge under the earsour animal, and hide under the very figure of the craft. To the dog turned out to be the most realistic and, of course, kind, real friend of man, we would like to finish her eyes and mustache. The nose of the dog also has its own color, so we will paint it in one of the darkest tones. A dog can not be without a tail. Therefore, we need to form it. To do this, you will need to bend the edge to the middle of the figure on the right side of the craft. Then we will give the tail a shape by means of two folds directed to the right. To the figure of the dog acquired its finalform, you need to make a few smooth, neat movements. Thus, the dog gets the right outlines of the back, head, gets paws. In addition to all of the above, we will make a muzzle to the animal. First, we make a small depression on the top of the head, and then the lateral parts formed as a result of this action, smoothly podgnem bottom. That's all. Our voluminous figure of a dog in the origami technique is ready. You can make several such figures of different sizes and get a whole family of beautiful dogs or lay down different voluminous animals and get a whole menagerie. This detailed master class contains an origami-dragon scheme from paper, which you can make with your own hands.